This was the best trip I ever did! Everything was perfect: the dinner at the tower, the cruise in the cruise and of course the moulin rouge, out of this world!!! This entire experience was 5 stars!! The Eiffel Tower restaurant had great food, amazing service and killer views! The river cruise was beautiful and the Moulin Rouge show is a must see! This is my second time experiencing this package and each time it got even better. If you are heading to Paris, book it now! 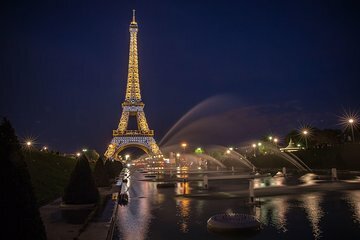 Perfect group of activities for an evening in Paris! The Eiffel Tower Dinner was fine. We were seated at possibly the worst table in the restaurant and the service we received was minimal when I asked for the check the waiter said it was all paid and walked away - maybe if he'd thought a tip was coming he'd have been at least a LITTLE attentive. Our driver was harried and on the phone most of the time arranging other pick-ups so we got to dinner late and he was VERY insistent that we rush from dinner to the boat or we'd be late for Moulin Rouge. Rushing wasn't too much of an issue since our waiter had zero interest in us, I guess. The cruise was nice, but when it was finished we had to wait half an hour for the same driver who told us to hurry and be on time - he arrived still on his phone. We picked up several more people and half of them were late. Moulin Rouge was fine too, except that we had terrible seats again - towards the front and on the wall so we could barely see the stage. I'm not sure if the tables are assigned randomly or if this was due to being booked through Viator, because I've purchased tickets directly from Moulin Rouge in the past and they have been perfect. At least the driver was there to pick us up on time after the show. It was all fine, not great for sure, but it was easy enough. Everything was wonderful, Moulin Rouge show was definitely an amazing experience. My only issue, which I feel I need to bring to the attention of The Moulin Rouge is in the middle of the performance a man who works there approached us and said there was a problem and he needed to see our tickets. While I was pulling them in on my phone he walked away. Then a manager came by and accused us of not having tickets. When I showed them to him he left us alone. I was very worried about whatever the problem was because getting kicked out in the middle of the show and waiting for our ride at midnight in the middle of the red light district was NOT something I would have appreciated nor would it have been very safe. It was an unfourtunate distraction to an otherwise wonderful show. Great experience from start to finish! A visit to Paris would not be complete without this wonderful Tour. First class and would highly recommend! Our Guide was excellent in every way ! My grand daughter and I had a wonderful time. The food was great and the service was amazing and the scenary was just breath taking. The show was fabulous. I would do this again.